Like a thrillingly invigorating Broadway musical, the pitch-perfect score for Walt Disney's Beauty and the Beast revisits notes, motifs and lyrics used in operatic early establishing crowd scenes so effectively that even if you haven't seen this particular masterpiece before, you’ll find yourself already humming along during the first run-through. Although the company had flirted with adapting the fairy tale back in the '30s and again in the '50s, the 1991 endeavor successfully built off of the high-quality musical treatment and inventive technical breakthroughs witnessed in The Little Mermaid , which was considered to be the studio's first “Disney Animation Renaissance” picture for illustrating the new direction the House of Mouse was taking. And despite the fact that the moral of the story is the celebration and importance of “inner beauty,” the tale of a beautiful woman learning to look past her beau’s beastly demeanor and behavior has long been the enemy of feminist scholars worried that young women who embrace the work as gospel may be more susceptible to abusive domestic relationships later in life. Yet thankfully giving our heroine a feistier and more progressive spin, we quickly realize that Belle (as voiced by Paige O’Hara) is – much like Mermaid ’s Ariel – a woman in full control, regardless of the fact that she’s so selfless that she’s willing to put family before herself by trading places with her captured father as the Beast’s prisoner to save his life. Belle’s decisions are always well thought out and far more heroic than the studio’s heyday presentation of Disney princesses as damsels in distress who fall asleep waiting to be rescued with a kiss (Sleeping Beauty, Snow White and the Seven Dwarfs ) since this time around, it’s Belle who must save the life of the man she chooses with the declaration of love and the requisite kiss. Needless to say we’ve come a long way since Sleeping Beauty ’s Aurora appeared onscreen for a whopping eighteen minutes back in 1959! For in addition to baffling residents of her quaint, sleepy French country village as the outsider oddball whose nose is frequently stuck in a book and a sunny disposition as a refusal to adhere to the gossip that her inventor father is a loon, Belle is the only woman in town who won’t give the physically dreamy yet appallingly chauvinistic Gaston the time of day. 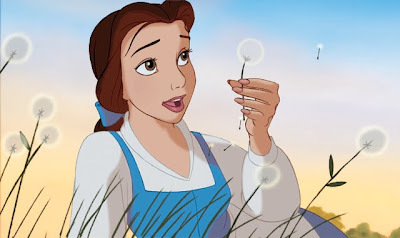 Knowing that a life married to Gaston will make her a veritable trophy wife as the gorgeous prey caught by a predator and then imprisoned to a life of wifely and maternal servitude, Belle goes against wedding tradition by opting for spinsterhood… until of course, she willingly gives up her freedom to save her father who’s been caught by the Beast in his castle. Yet, unbeknown to Belle, her arrival and replacement as captive has come at a fateful time in the life of the Beast who, three years earlier had been turned into the ghastly animalistic creature she sees before her by a visiting enchantress whose wretched appearance brought out the superficial cruelty in the previously handsome prince. 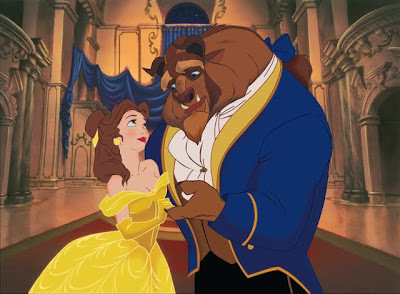 Obviously, adults watching will draw a parallel between the Beast and Gaston as the former used to be as physically handsome as the latter but now that circumstances have rendered the beastly prince ugly, he’s been cursed to remain that way for life unless a woman falls deeply, truly in love with the man underneath the fur before the last petal of a rose falls after his twenty-first birthday. 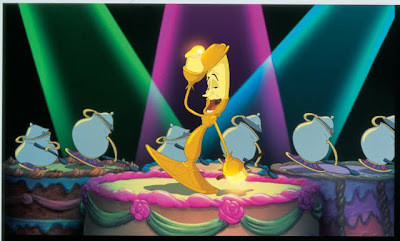 And while admittedly the “inner beauty” moral does get a bit buried in the overwhelming splendor of the watershed production from swinging chandeliers and singing teapots as Disney fills out the cast with its trademark adorable supporting players to appeal to children as comic relief, the sheer complexity of the work must be commended. Riveting, fast-paced and high spirited as it lures you into its dreamlike state right from the start, Beauty remains one of the grandest spectacles the studio has ever created which is all the more apparent in this lustrous Blu-ray which enhances the pleasing sights and sounds to make the strongest impact since its ’91 theatrical run. 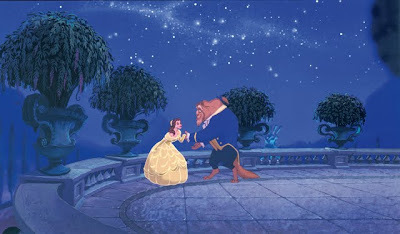 As the first Disney picture to employ a complete working screenplay to ensure that the characters were far more three-dimensional than in some of the sumptuous classics that placed style over substance, Beast’s success as an animated work cannot be understated as it became the first of its genre to receive the same acclaim usually attributed to live action movies, garnering an Academy Award nomination for Best Picture. Concurrently, the film ushered in not only Disney’s Renaissance but also challenged other companies around the world to pick up the gauntlet by initially augmenting the credibility of animated works traditionally seen as kiddie fare by snobs and sophisticates. 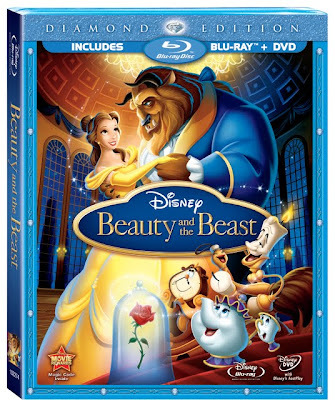 Given the royal treatment by its understandably proud parent company in the Diamond Edition DVD plus Blu-ray combo pack which fills the three discs with special features along with various versions of the revered film by inviting you to sing-along or see the extended cut, once again and nearly twenty years later, Beauty and the Beast sets the bar for high caliber family entertainment with this jaw-dropping high definition transfer.